80’s New York Hard Rock/Metal for fans of Dokken, Fifth Angel, Whitefoxx, Battle Bratt, etc. Reissued on CD for the first time in europe includes the rare privately pressed 1988 album “Locked and Loaded” and two bonus tracks (Demo 89). M-16 shared stages in the 80’s with bands like Ratt, Armored Saint, Wrathchild America, and fellow New York bands Dirty Looks, Roxx, Triffid and Blacksmith. 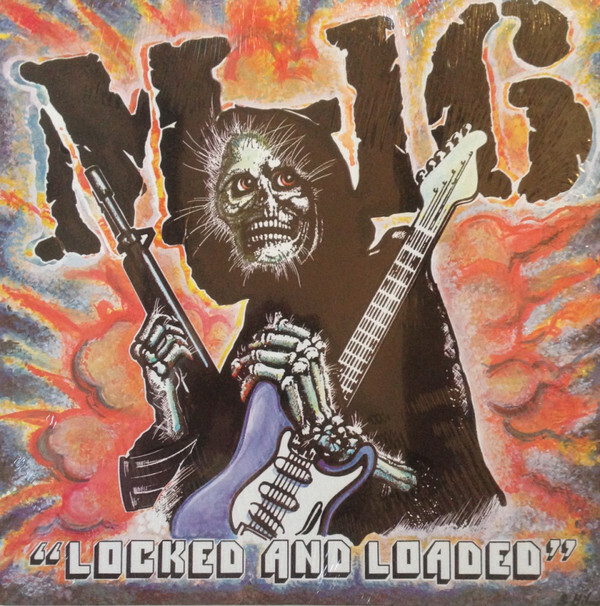 Carefully remastered and presented in a 12-page booklet with band history and rare photos, this release marks the celebration of the 30th Anniversary of “Locked and Loaded”. The 1980s was a decade of flamboyance, excess, and decadence; all the ingredients to make up one hell of a time. Like David Lee Roth once said, “the people shined, and the music shined.” Nowhere was this more evident than the glittering glam cesspool of Los Angeles, where the country’s wildest and flashiest bands made the Sunset Strip sound extend far beyond Doheny Drive and Hammond Street. Like an out of control epidemic, the mindless self-indulgent sounds of flash metal and party rock spread throughout the country. In nightclubs all across America, circuit bands spread their simple message of having a good time while rock ‘n’ roll was still alive and well. The fever spread quickly and no town was immune to big hair, colorful spandex, loud guitars, and those oh so melodic hooks. One of the hot spots at the time was, unsurprisingly, New York. Already home to bands like KISS and The New York Dolls, the area was certainly no stranger to a good time. Multitudes of nightclubs full of rock star hopefuls littered the state. In the Capital District, before heading out for the night, one would pick up the local Metroland Magazine to find out who was playing in the clubs. Scanning the many nightclub advertisements, often all eyes were searching for the familiar machine gun toting grim reaper that heralded a performance from the one and only M-16. M-16 was formed in 1983, and consisted of lead guitarist Glen Oliver, drummer Tom Verrigni, bassist Steve “Mote” Vandyke, vocalist Greg Simmons and rhythm guitarist Gary Ranze. The band quickly hit the scene, making the rounds to all the hottest rock clubs around the metro area. It did not take long for M-16 to begin to gain a dedicated fan base by playing covers of popular songs by Judas Priest, Iron Maiden, Dokken, Scorpions, and others, as did most other bands on the circuit. That year personnel changes found Ranze and Simmons leaving the group and being replaced by Eddie Scutt and Darren O’Brien. By the end of 1984 musical differences began to cause the troop to splinter, and M-16 eventually became non-functioning. In 1985 founding members Oliver, VanDyke and Verrigni decided to continue M-16 adding new members Kevin Egnor on second guitar and vocalist Lenny Thomas. The new line up would only play a few shows before drummer Tom Verrigni would be replaced by Pete Sivaslian. With a newfound stability in the ranks things began to click as M-16 marched out on an East Coast club tour. The band continued touring throughout the Northeast for the next two years playing with bands like Armored Saint, Wrathchild America, and fellow New York bands Dirty Looks, Roxx, Triffid, and cult metal heroes Blacksmith. They hit clubs throughout New York, down to Maryland, over to Pennsylvania, and as far up as Maine to play the famous Free Street Pub where Led Zeppelin had once performed in the ’70s. At this time the guys had begun to write their own original material that was being shuffled into their sets. Things became extremely busy for M-16, who would sometimes play 3-4 shows a week. Their first original song “Wasted Love” was released to local radio stations, receiving airplay in standard rotation. Stations WPYX and PYX106 Metal Shop received a steady flow of requests for the single. Then in 1986 M-16 was asked to open up for Ratt at R.P.I. Fieldhouse in Troy to a crowd of 8,000 screaming fans. Originally Poison were the opening act on tour with Ratt but had to pull off due to Brett Michaels’ health issues. This chance occurrence was a perfect opportunity for M-16 to increase their fan-base. By 1987 M-16 was ready to enter MCE Recording Studios in Schenectady, N.Y and begin recording what would be their debut album. In 1988 Locked and Loaded was released, receiving favorable reviews from fans and critics alike. The DIY release sold an amazing 15,000 copies nationwide and 10,000 overseas. More East Coast touring continued to promote the album. After a year on the road drummer Sivaslian was replaced by Gary Seeley, and soon after guitarist Glen Oliver left and was replaced by Russell Harnish. In 1989 M-16 returned to MCE Studios to record two new tracks “The Game” and “Play It Loud” that were never officially released. Another year of touring followed before guitarist Harnish would leave, replaced by Dan Wos. M-16 continued to tour for a few months but the end of 1990 the band had run out of ammunition and split up. In 2007 M-16 would come back together for a reunion show dedicated to the memory of Pete Sivaslian, who passed away in 2000. After 17 years members Lenny Thomas, Glen Oliver, Kevin Egnor, and Steve Vandyke all decided to reform the band and once again hit their local circuit. Not unlike their many lineup changes, the years since M-16’s beginnings brought many changes to their regional metal landscape. Peers like The Emerald City Band, Angel Cruz, Run 21, Reckless Romance, Virgin and countless others are nothing more than fond memories, the once thieving nightclubs and venues no longer exist, and the audiences have all grown up, and the hair is no longer as big as it once was. But one thing is still present in the Capital District and that is M-16 and their machine gun welding grim reaper. File Under: Melodic Metal, Heavy Metal, Hair Metal. For fans of: Dokken, White Lion, Whitefoxx, Metalwolf and Shire.